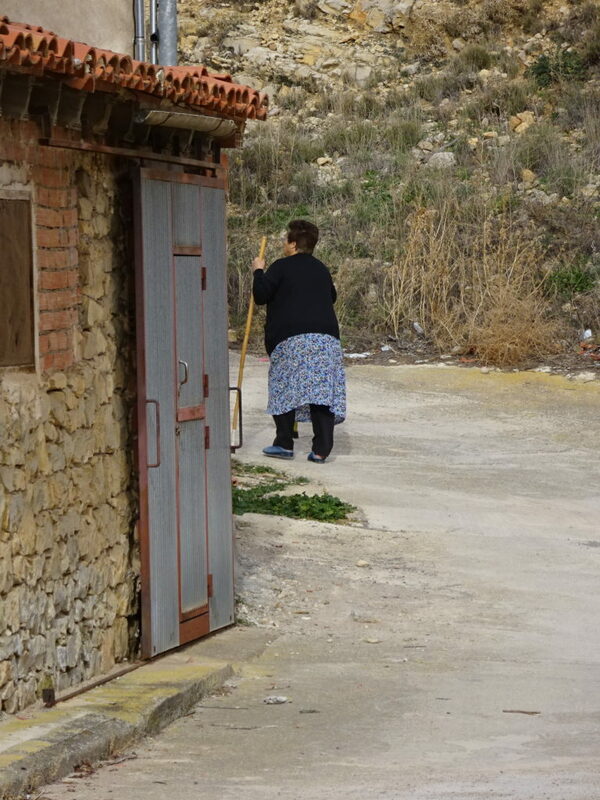 Posted on June 8, 2016 by No Map Required Posted in Places, Spain	. 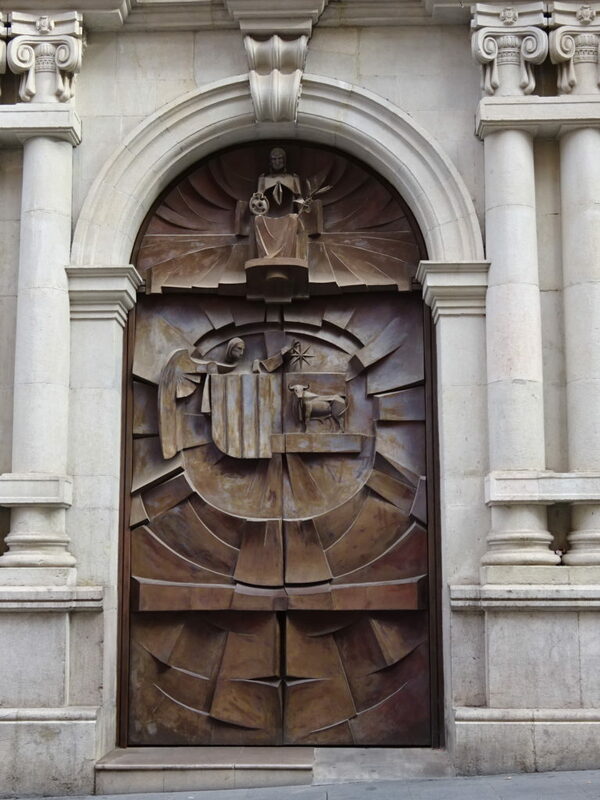 I can hear it now, “But wait… you’re in Spain? I thought you were back in Seattle…what’s going on! ?” You’re not going crazy, we are back in Seattle. This particular post is just a few months late. And it won’t be the only one! Between so many wonderful folks visiting us in Europe, house-sitting and figuring our final stops along with a re-integration plan for the US, well, we simply got behind on writing. Sooo, grab a glass of temprano, a plate full of olives and some sort of uber-fashionable jacket with a diagonal zip – in black, of course – and let’s get back in a Spanish frame of mind. After having a blast in Barcelona with Aaron’s mom and sister, we took a long weekend in Zurich to visit friends and then still had a couple of weeks before starting our month-long house-sit in the Spanish hill town of Lubrin. What’s a pair of travellers to do? Road trip, that’s what! 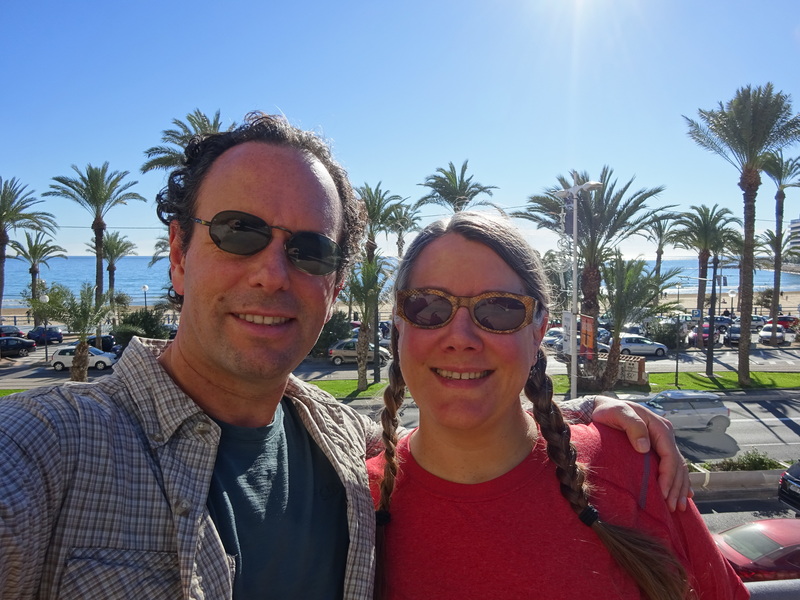 First stop (and later our last before leaving Spain): Alicante – one of several seaside towns where we enjoyed walking along the Mediterranean. Thank goodness for assigned seats! (HA!) 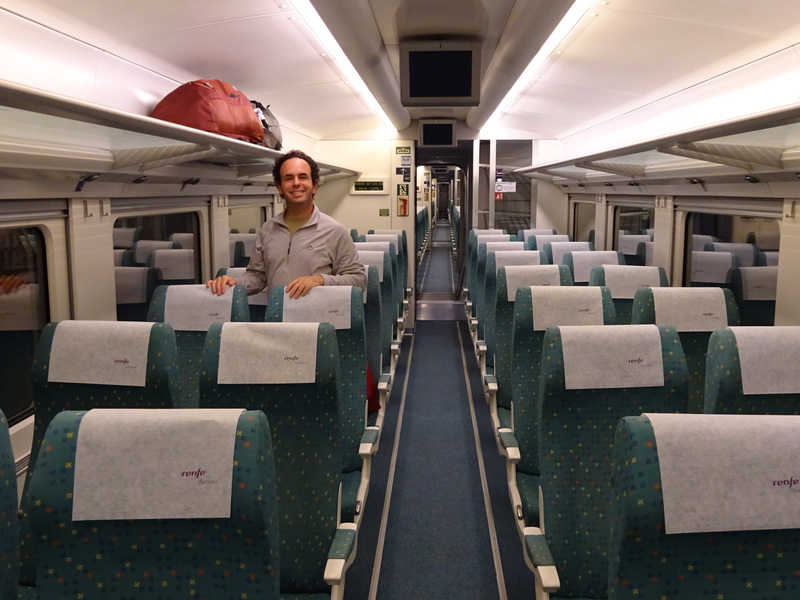 We traveled from Barcelona to Alicante by rail. For awhile we were the only people on the train, but it did eventually fill up. 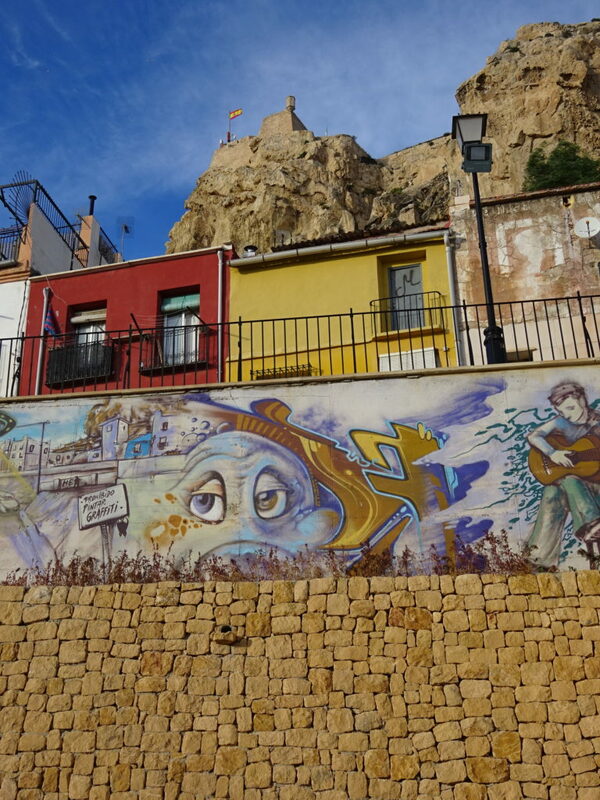 A slightly touristy, seaside town where people go for the weekend; Alicante is actually super charming and relaxing. Hello, Mediterranean! Yes, of course, we found the street art! 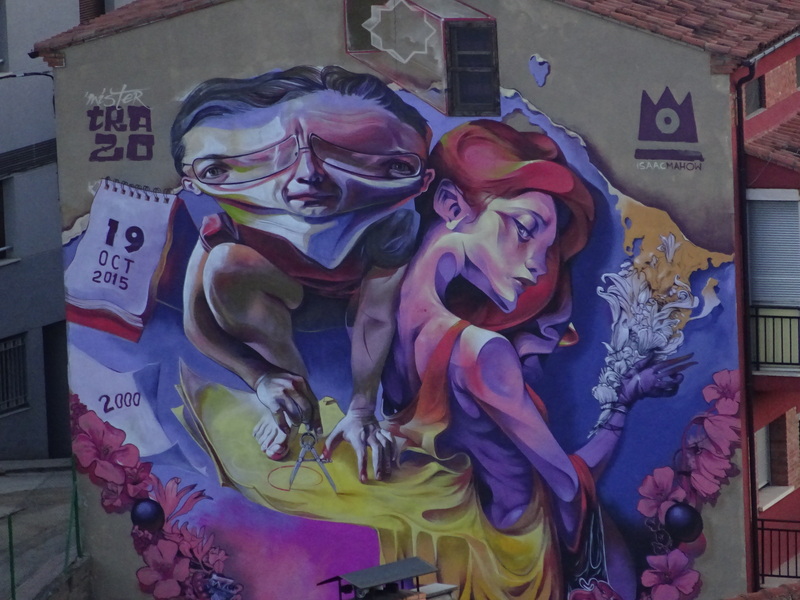 We stumbled on this long road just jam-packed with art! 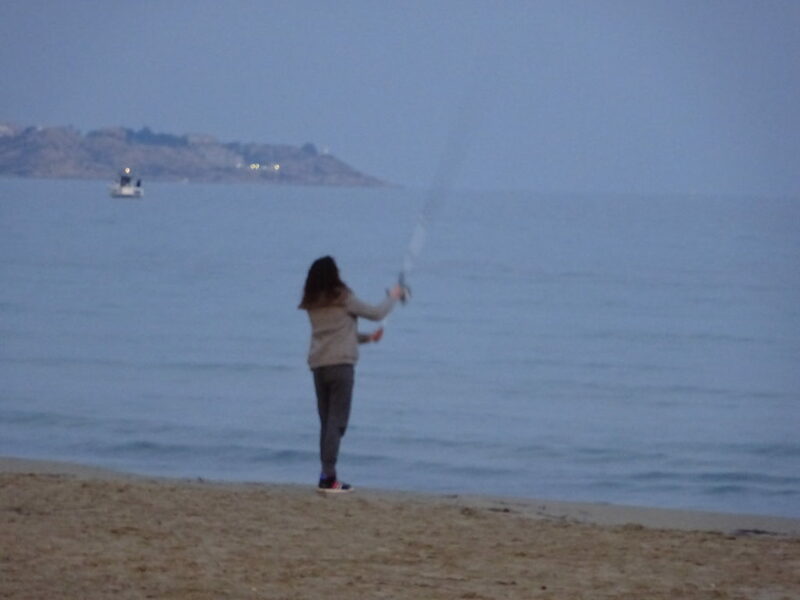 Every town we stopped in had people fishing off the beach. On this night, every few feet brought another person casting a hook. Fishing is nice and all, but I think you know us better than that. Bring on the ice cream! Now we’re talkin’! This was Laneu, one of the tasty gelato stands in Alicante. 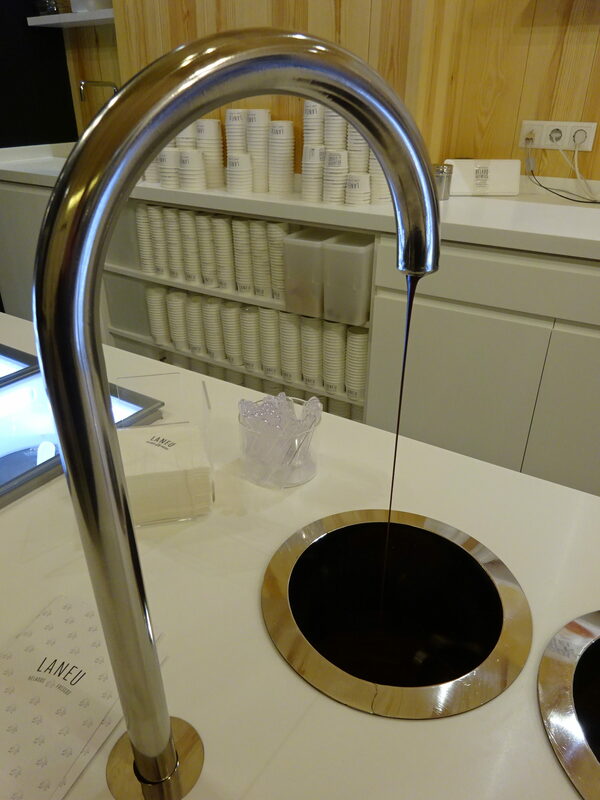 Yes, that’s right, that IS a chocolate faucet! I want one. Liquid chocolate. Now. 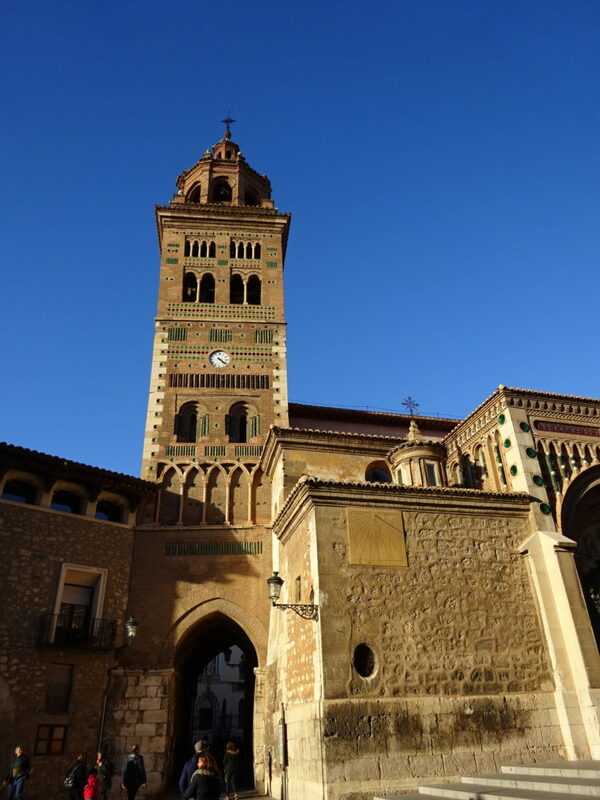 No wonder everyone falls in love with Spain. We also stayed in a one of the best hostals of the entire trip: Hostal Smile & Co. New, clean, friendly and well located. We had a nice breakfast and the owner could not have been more welcoming and helpful. We totally recommend it. So does everyone else if you check reviews online. A seriously beautiful day with the Mediterranean behind us. 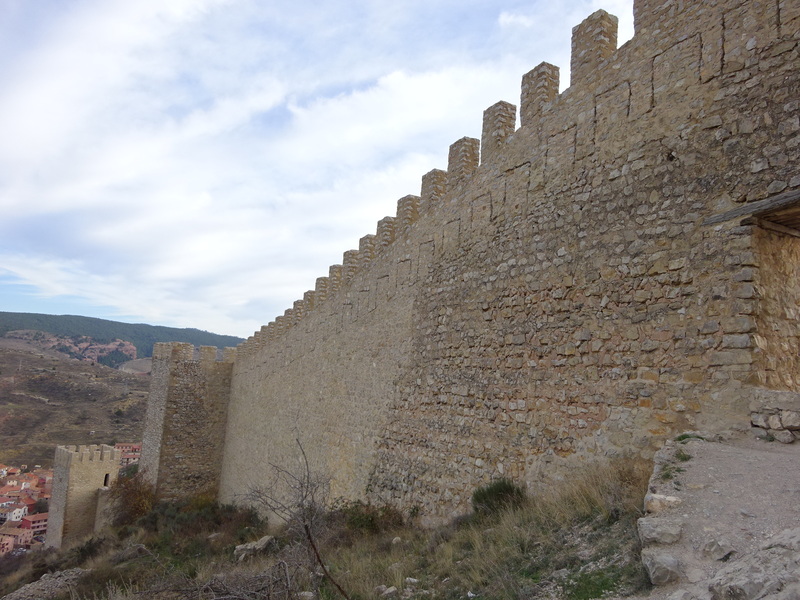 This was actually our 2nd visit to Alicante and very last day in Spain! Enough with that beach stuff, bring on the mountains! 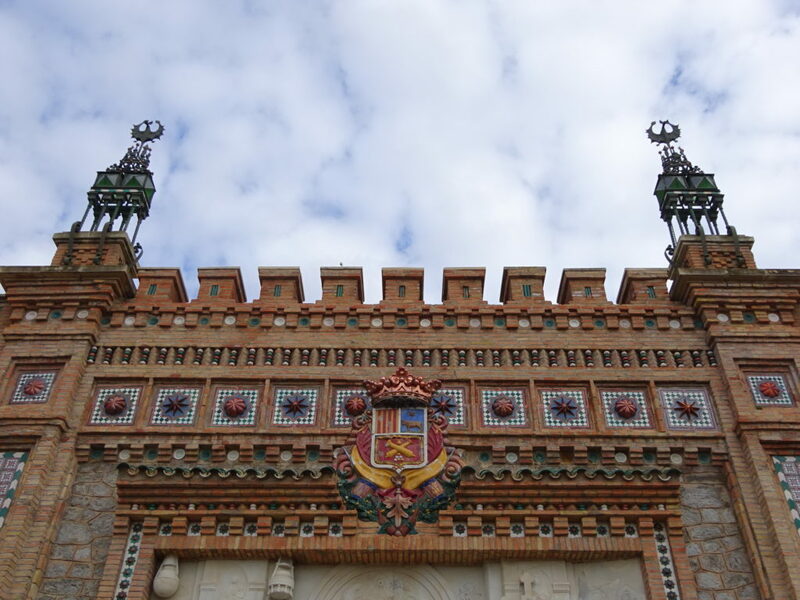 Next stop: Teruel. We picked up a car rental, pulled out the TomTom GPS unit we purchased in Barcelona and charted our path into the hills. Not having a phone or a data plan for our tablet, we came to really depend on GPS devices in Europe (because in spite of our name, we really do need a map on occasion). 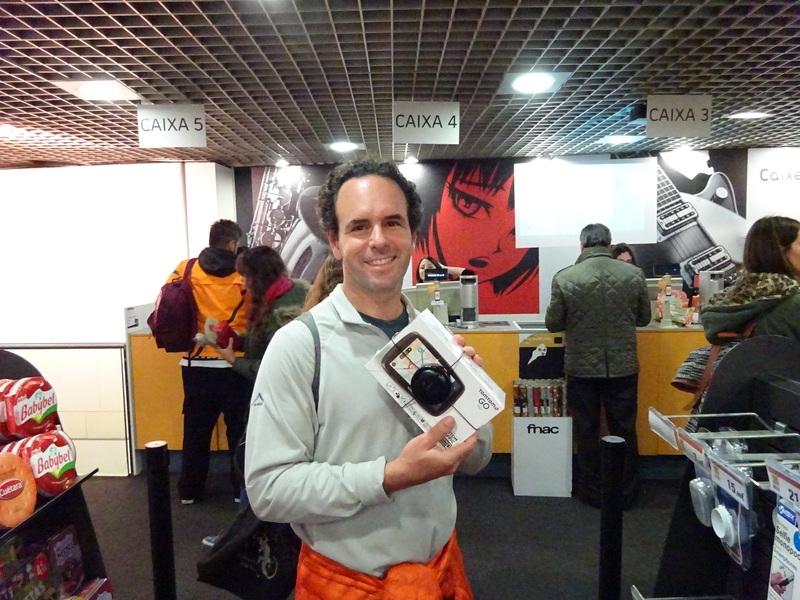 We borrowed devices in a few countries, but finally had to bite the bullet and buy our own in Spain. It made our road trip so much easier … and we are still using it back home in Seattle! 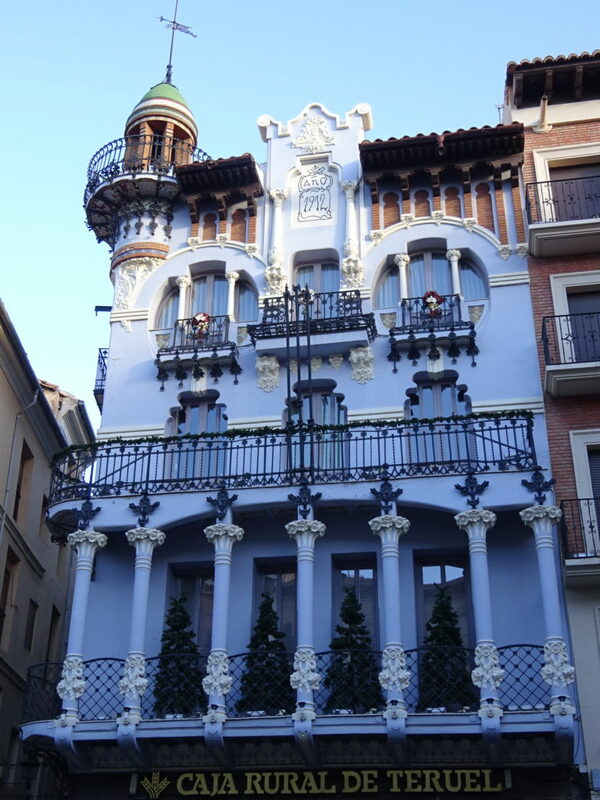 Teruel was nice for walking around, having a lot of modernist/art nouveau architecture. It seemed to be a place where locals spend a weekend when they want to explore some interesting history and building styles. It was December, so Christmas trees were going up. Unlike the US, Christmas trees appear at the end of advent…not the beginning of Halloween. Just sayin’. Do I ever get tired of that shade of “Spanish Sky”? …um, never! And arches leading to narrow little alley ways? Unh-uh. Need the time? Just check the sundial, of course. 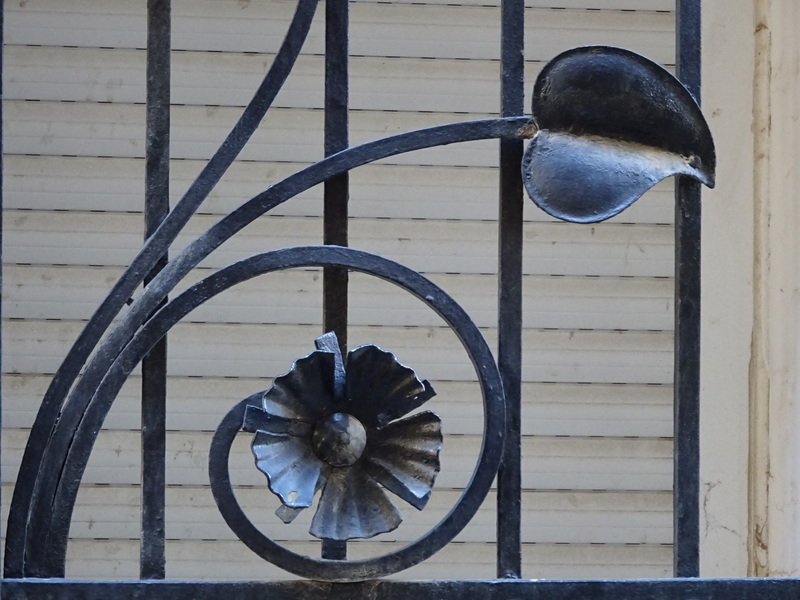 Like Barcelona, even the most mundane things came with a touch of style. That’s a mighty fine gate, right there. BRIIIIDGE! Even the modern bridge is a beautiful design and you know I like a bridge. So, so great finding street art everywhere, even in these small hill towns. Checking our notes, we had a lot of food in Spain we thought was mediocre. This photo got the biggest Facebook response of our entire trip. Surprisingly it was one of the tastier dishes and Aaron ate it right up….except for the baby eel thingys. Just a few of those were enough. 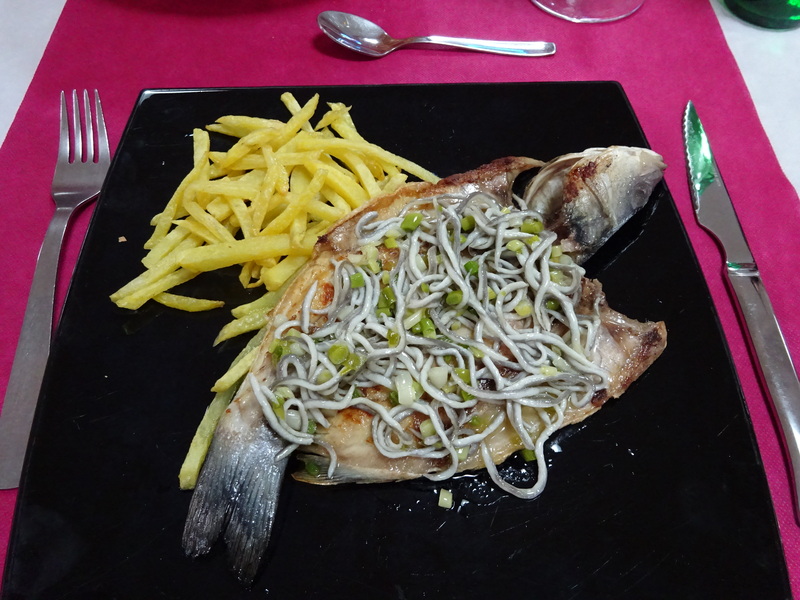 This was the meal at the hostal we stayed at, Hostal Puerta de Teruel. It was the best lodging we could afford, but hopefully if you go you can spring for something better. If not, it was good enough. 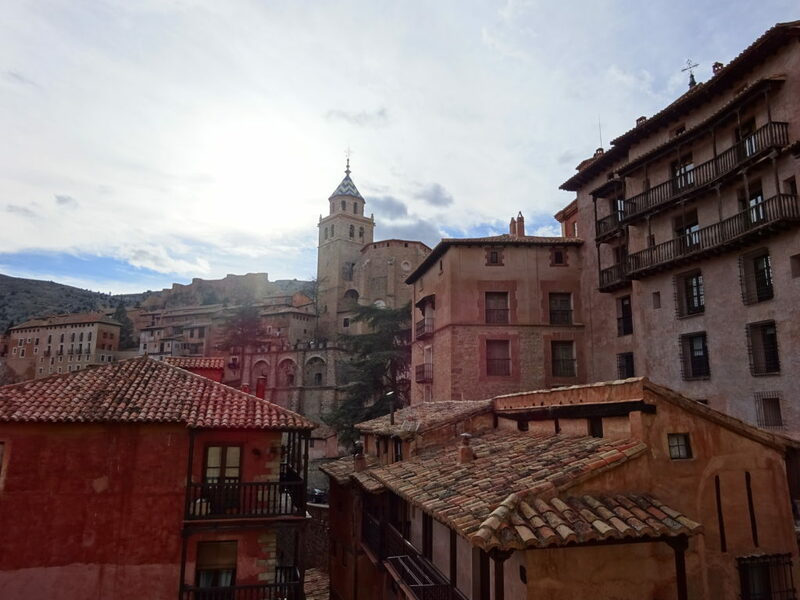 After a couple of days it was time to move on to another hill town: Albarracin. 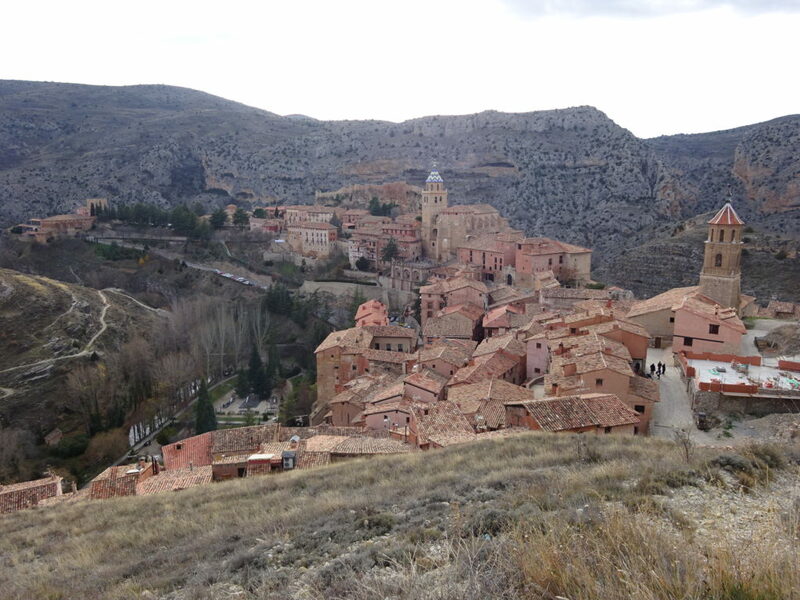 More accurately, we stopped for the day in Albarracin on our way to Albacete, the half-way point between Barcelona and Lubrin. Got all that? 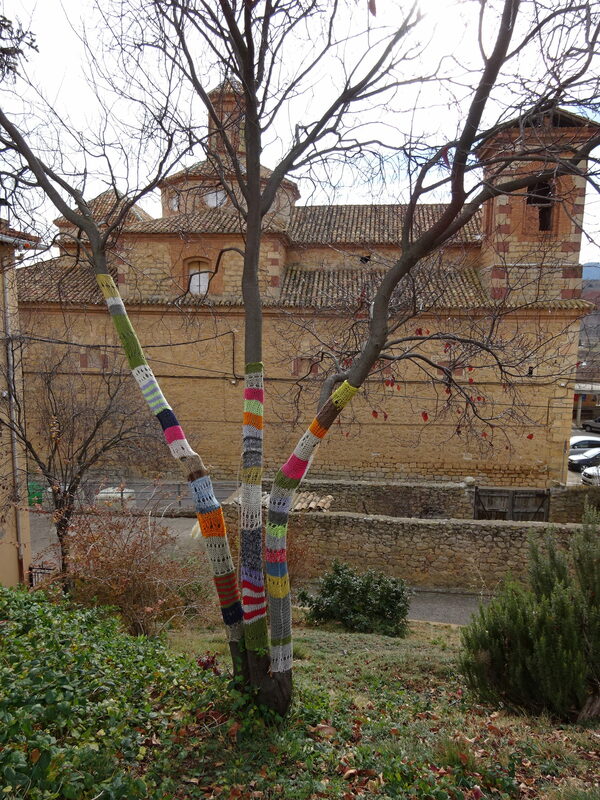 We just happened upon this yarn-bombed tree as we drove through this tiny, tiny hamlet on the road to Albarracin. How great is that? Could she have been the bomber?!? 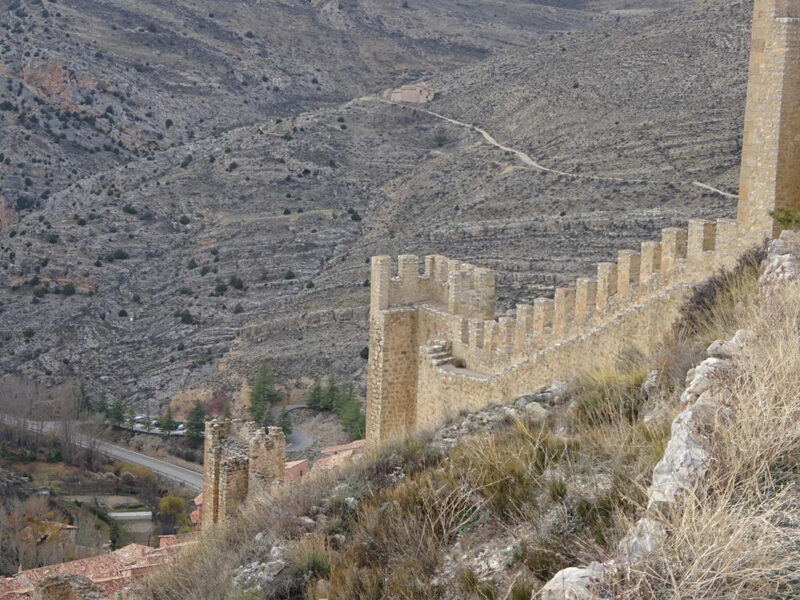 Albarracin’s claim to fame is its ancient castle overlooking the adorable town. We wandered through the town a bit before heading up. And up. And up to get to the castle. The views were totally worth it. Along the way we passed oodles of tourists and little shops catering to them. I couldn’t get over how old, crowded, and slanty-angled the buildings stand. 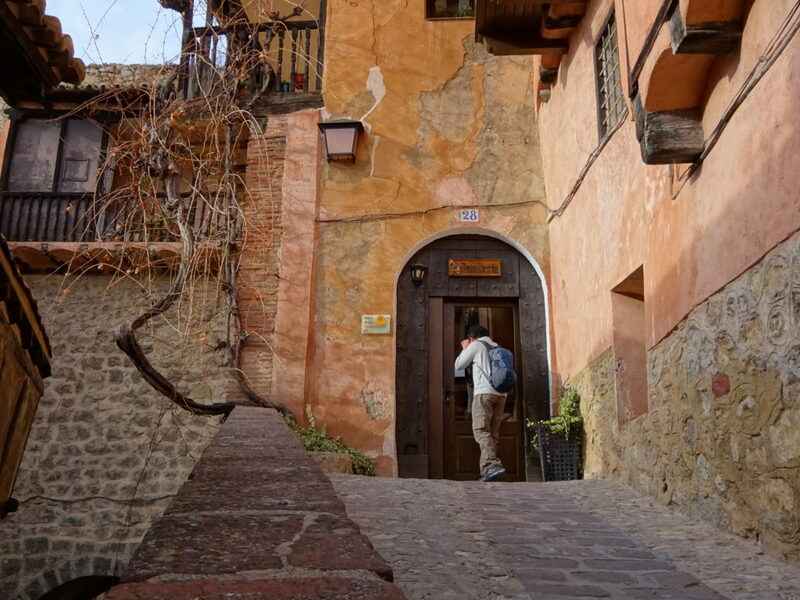 Surprisingly busy Albarracin. 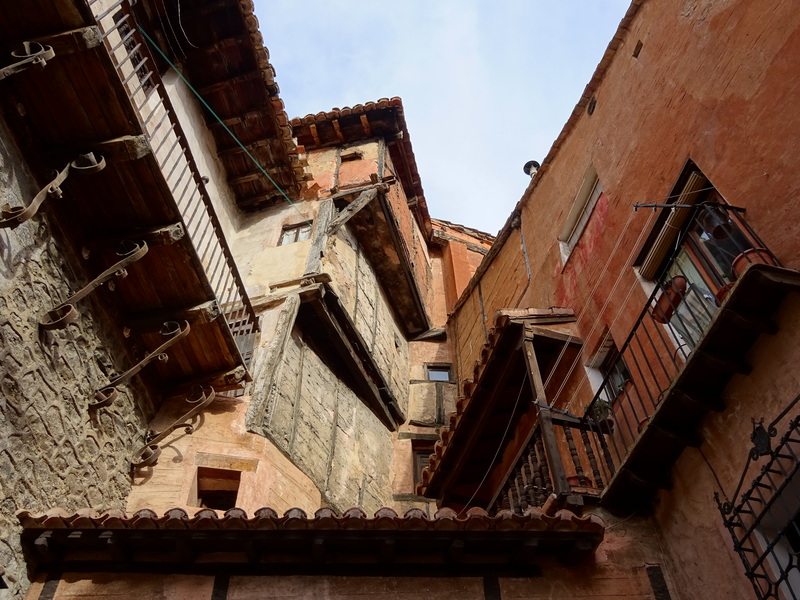 Double-click to get a better view of this very, very old part of Spain. 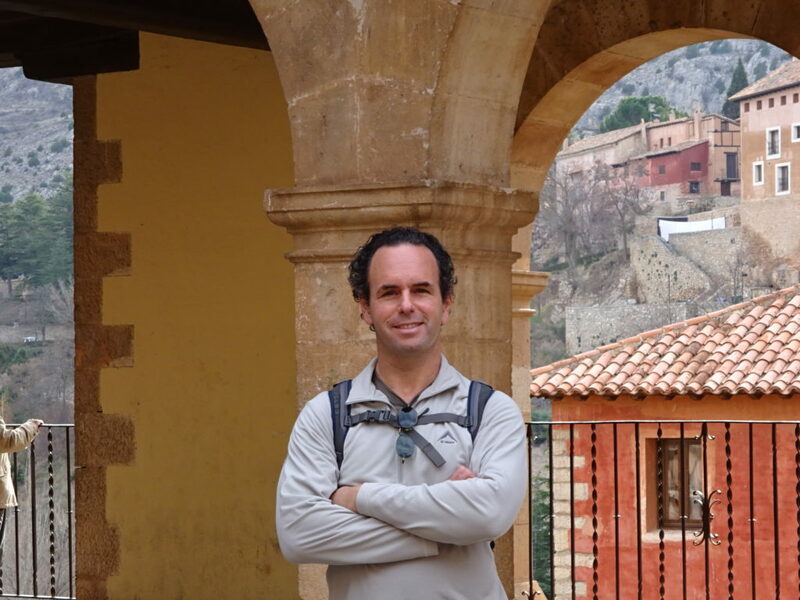 Handsome Hubs in the middle of a little square about half-way to the castle. Hey! We walked there! Albarracin from up high, looking down from the castle. 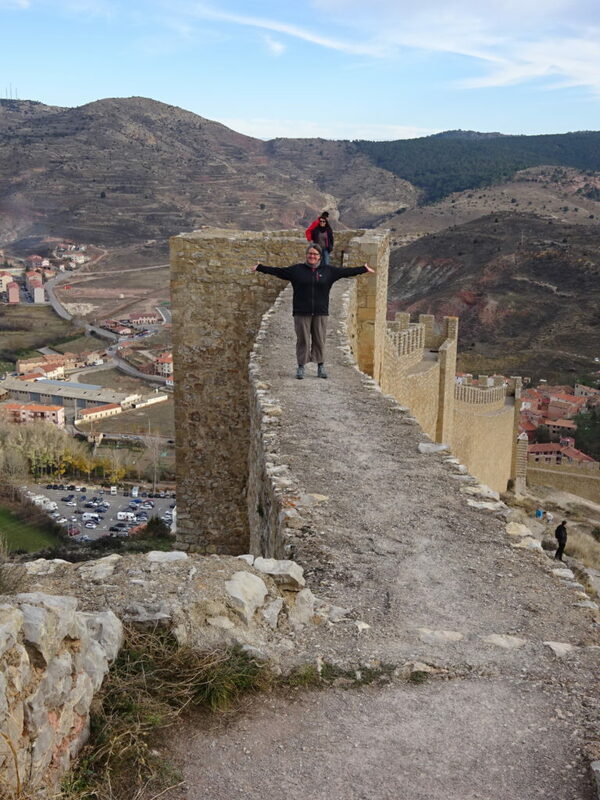 As you can see in the photo, Albarracin is one of the “Red Villages” in the Spanish hills. 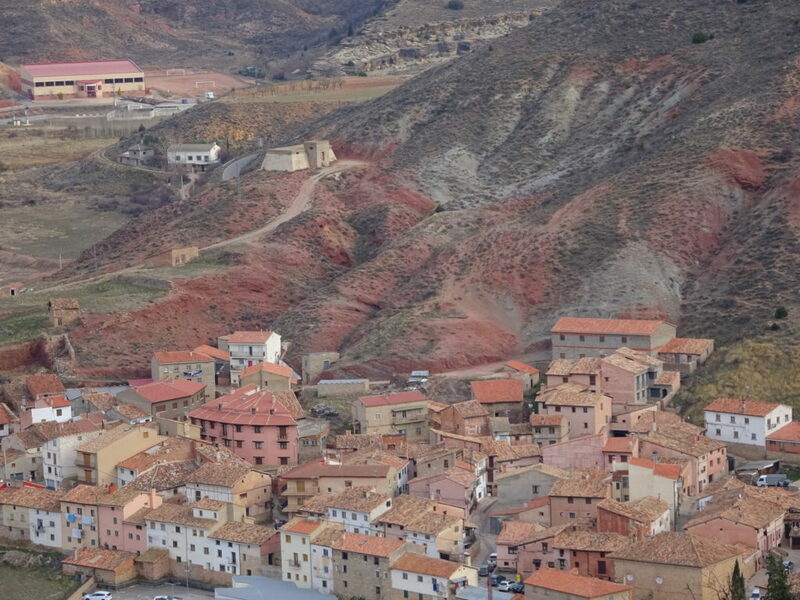 All the buildings are a reddish sandstone and the roofs are all red. We’ll show you a “White Village” when we post about Lubrin. Love all the angles of the buildings as we made our way up to the castle. All along the way: homes, restaurants and little stores. Looking over the slightly more modern part of town. Love how the colors resemble the hillside. We made it! Ruins! A castle! Europe! They just don’t build ’em like that anymore. Ok, I guess the words “like that” weren’t really necessary, eh? I shall walk the castle wall. Ta-Da! After lunch and the purchase of some delicious local chocolate, we had to head on as we had clients awaiting us the next day! 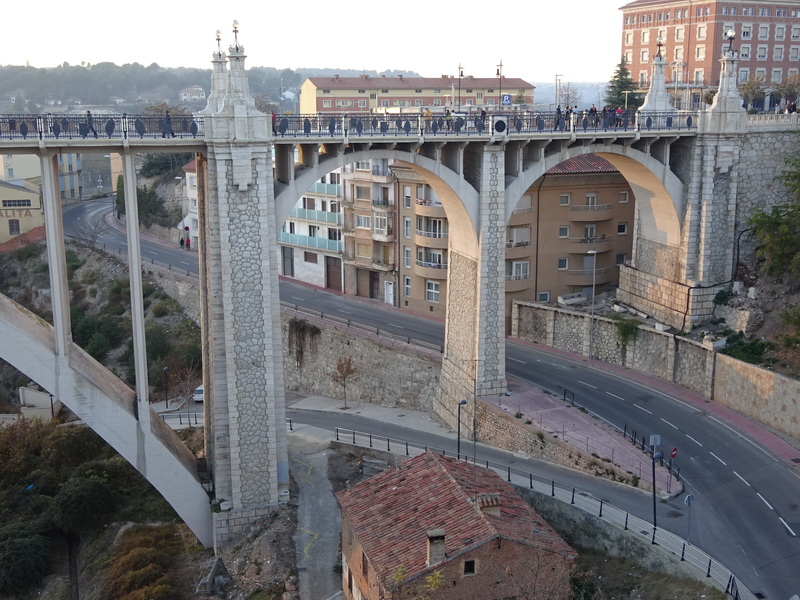 We spent the night at Hotel Sidorme in the bigger city of Albacete — roughly the equivalent of staying at a Holiday Inn just off the highway. It was sort of a business hotel. 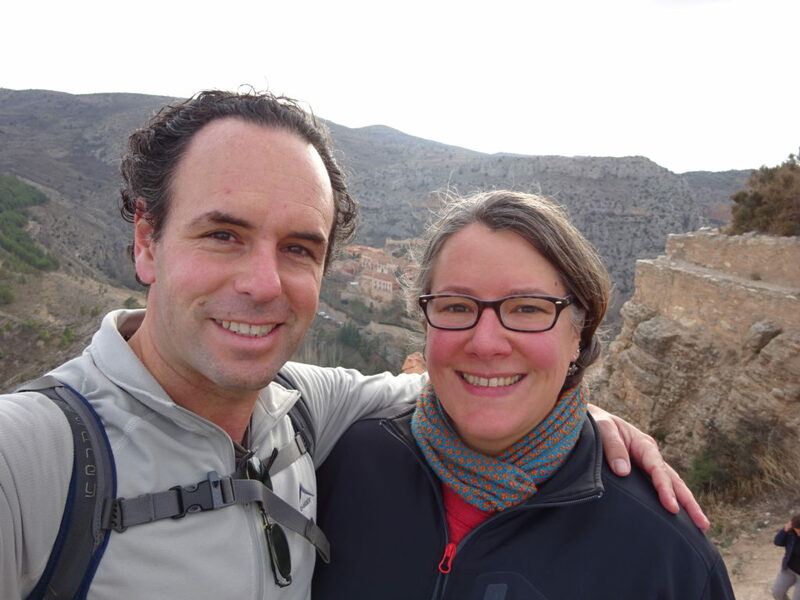 The area we stayed in was pretty barren — a few big box stores and businesses and warehouses — we were definitely not in the touristy part of town, or even tourist-friendly part of town. The hotel was clean and modern, though, and when we got there the hotel warmed up some frozen pizzas for us, so we were pretty happy. Those are the things that make you happy when there’s no restaurants nearby! The next day we headed to Lubrin to meet Mike, Cheryl and Cheech, our pup charge. I think you are still traveling – in your minds anyway. I looked carefully at the ice cream. Since you didn’t mention a flavor, you were (are still?) in Spain and the color was suspicious, I assume it was guacamole ice cream. Right? We are ABSOLUTELY still travelling mentally! Been thinking of where we most want to go explore next. Right now it’s a toss-up between Colombia and Cuba. The ice cream was actually pistachio! 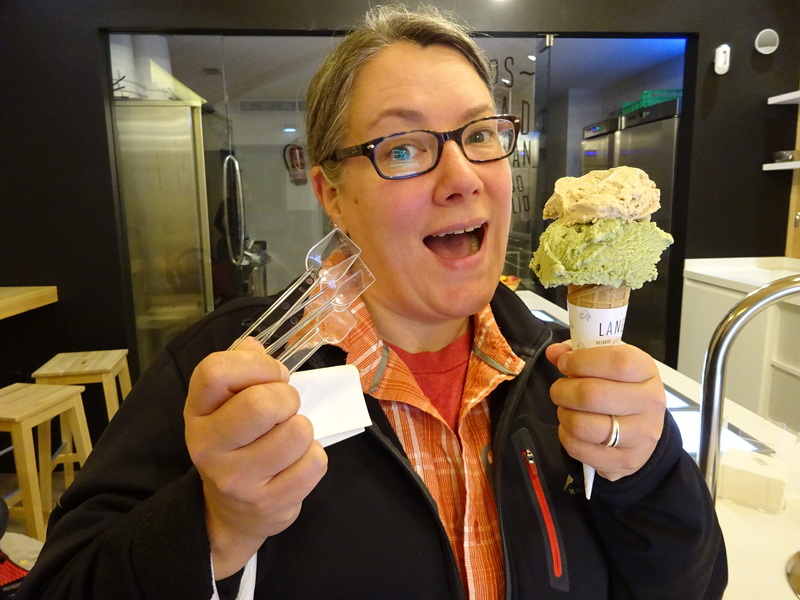 Anner tried about 10 flavors before deciding on it…and though it might have been the best pistachio she’d every had. Love choosing well!